Safety measures and proper use of equipment is very important for tree care companies during a job. When the correct gear is not worn, or equipment is carelessly used this can result in moderate to very severe injuries. It can even result in death. Even a smaller job such as pruning a tree can still leave a worker open to getting hurt. Although lives and physical safety is what matters most when it comes to safety another factor is the cost of being unsafe. Experts report fines up to $12k per violation. This means for instance, if a worker has one tool with two damaged areas they would be fined twice. Any type of tree service worker should have regularly updated training on safety standards in areas of equipment use and safety. Tree care companies should continuously provide resources for their employees to stay in the know. The following information on chainsaw safety is drawn from an ITCC workshop held at Brackenridge Park in San Antonio, Texas. Arborists and employees from different tree care companies gathered together for this special event. Information on chainsaw safety was presented followed by a demonstration of how to generally handle this particular tool. The number one piece of personal protective equipment, or PPE, required for all tree care service workers is a hard hat. Clearly this is the most important form of protection as the head is one of the most vulnerable parts of the body. Alongside this protective eye wear is next on the list. When pruning a tree or cutting a tree debris can shoot out unexpectedly towards a worker. Sometimes helmets come with protective eye wear attached already to it, but purchasing this type of hat is not required. So, if not attached separate eye wear must be provided. Followed by head, and eyes are PPE pieces that have a little more flexibility with the types worn. Among these are ear muffs or ear plugs, leg protecting pants, and solid boots. Before handling a chainsaw it is important to make sure the PPE checklist decided by the employer has been reviewed and followed. When handling a chain saw keep in mind that it is not just about having the correct protective gear on. The worker must also be in a good healthy state of mind. Feeling tired, sick, or any physical discomfort can create a slip in judgement. When the worker is prepared on both accounts they are ready to work with a chainsaw. 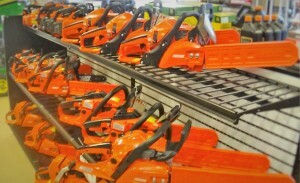 Experts say the best ways to start a chainsaw is on the ground, or by what is called a “leg clamp.” Leg clamp starts are done with a number of tree trimming and removals because the worker must reach the higher points of branches. The handle of the chainsaw is placed behind the knee to start it. It must be secured in at least two different ways if working in a tree. Attention is paid to posture so that the person handling the chainsaw is always in control of its path. Experienced tree care workers try not to use the tip of the chainsaw bar to do the cutting. This helps with control and prevents the teeth from getting stuck. Similar to chopping up vegetables at home it is best to be positioned so that the tool moves away from the body rather than towards it. When moving around with the tool, anyone working in the area should be alerted so they do not get in the way, potentially causing injuries. Clear the path of not only people, but any materials or debris that might snag while walking. The area around the worker and chainsaw is noted at all times. Much of chainsaw safety has to do with preparation and education. Workshops and presentations such as the one held by the ITCC keeps workers informed, but more importantly equipped to create a safe environment during a tree care service job.